Ductilic, Inc. has superior ability to manufacture high quality parts at competitive price for OEM customers. We built to your specifications. 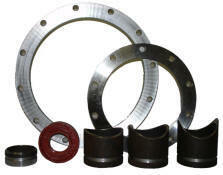 Natural rubber and special formulated synthetic rubber gasket and parts. Fabrication from tooling to assembly of a complete product. Assist in other aspect, such as shipping and forwarder information and coordination. Copyright © 2005 Ductilic, Inc. All rights reserved.